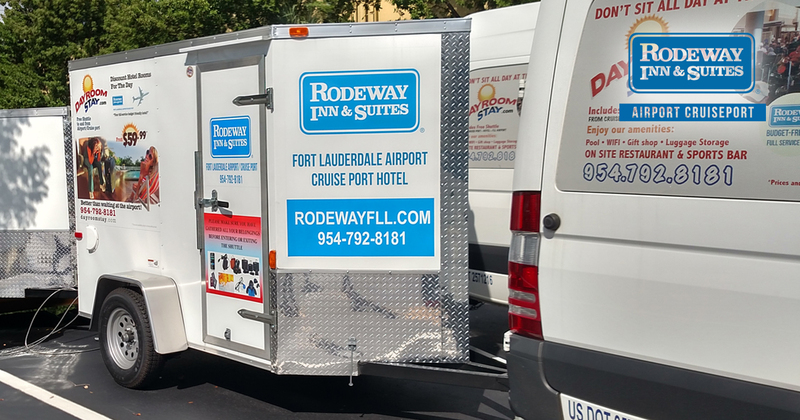 To make getting around our hotel easier for our guests, Rodeway Inn & Suites – Fort Lauderdale Airport & Port Everglades Cruise Port recently completed construction of an elevator to easily get our guests and their luggage to the top floor of our hotel. To help our guests further, our Fort Lauderdale cruise hotel recently purchased high-end, sturdy luggage trolleys to further enhance guest experience. Our hotel specializes in cruise vacationers. Since some cruises tend to last more than a week, and require multiple outfits including formal suites and dresses for formal dinner nights, the amount of luggage vacationers bring can be quite sizable. Our convenient luggage cart alleviate any difficulties with carrying heavy luggage by allowing our guests to easily roll their suitcases and bags to any part of the hotel, on any floor. Front Lobby – Right at the front of our hotel, six trolleys will be available for the arriving passengers. Elevator (First Floor) – Four trolleys will be available for any guest by the first floor entrance of our elevator for anyone needing easy access to the second floor — just grab a trolley, grab your luggage and get in the elevator. Elevator (Second Floor) – Four more trolleys will be by the second floor entrance to the elevator for guests staying on the second floor of the hotel. To operate the trolley, any guest can insert a Quarter ($0.25) into the lock and unlock the trolley. The trolley can then be used as many times as needed to get all the luggage to the guest’s room. When done, the guest can return the trolley to any of the three trolley hubs listed above. Upon inserting the lock chain back into the lock, the guest will receive their quarter right back — we are not charging for our trolley use! For those who do not have access to Quarters, change will be available at the front desk. If any guests need additional help getting heavy luggage into their rooms, porters are available to assist any guests. Porters will also have use of heavy, large luggage carts for especially large and heavy luggage loads. Have your luggage ride in style with our new luggage carts. Fly into South Florida early and stay at our Fort Lauderdale airport hotel — after a good night’s rest, get on the way to wherever your Florida stay takes you! This entry was posted in Cruising and tagged Cruise Hotel, Fort Lauderale Cruise Hotel, Fort Lauderdale Hotel, Free Shuttle. Bookmark the permalink.